Fregola with Goat Recipe - Fregola con Carne di Capra ~ Sardinia Baby! We first had this dish in Alghero cooked by our dear friends Giovanna Solinas and Domenico Meloni. The goat meat has a very strong flavour slightly like mutton but tastier! Goat is classified as red meat but is leaner and contains less cholesterol and fat than both lamb and beef. If you can't get hold of Goat meat lamb will suffice. 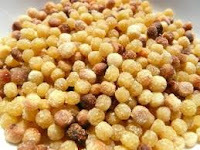 Fregola (also called Fregula) is a type of pasta from Sardinia. It comes in varying sizes but typically consists of semolina dough rolled into balls 2-3 mm in diameter and toasted in an oven. This fantastic dish sounds much more appetizing in Italian than in English! Boil water for the Fregola and chop the goat meat into cubes. Chop the garlic and onion and transfer into a large pan with the Olive Oil. Gently fry on a low heat until the onion is soft and gloden. Add the chopped meat and stir until sealed (approx 5 minutes). Add the Tomato Passata with the bay leaves and salt. Stir and let cook for about 15 minutes. Add the Fregola and salt to the boiling water and cook until “al dente” approximately 10 minutes or less. Taste regularly to avoid over cooking (if the fregola comes from a packet you can follow the cooking time indicated). Add the drained fregola together with some of the boiling water you have used to cook it in (as much as a small-middle sized ladle will hold) to the pan where the meat is still cooking. Let cook for a further 5 minutes. Sprinkle with pecorino cheese and serve. Enjoy!